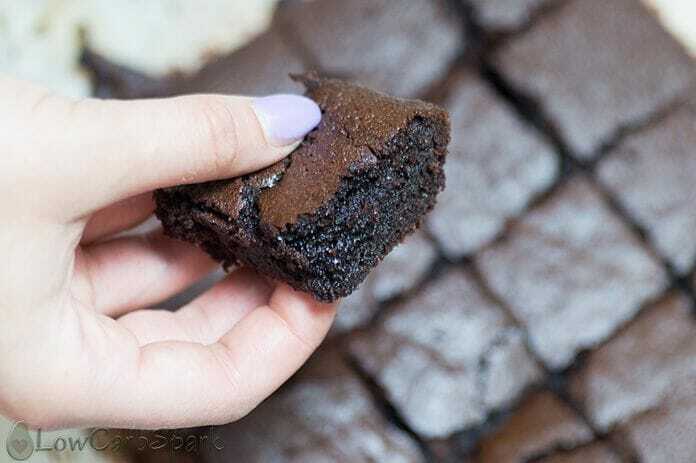 These super easy to make keto brownies are super low in carbs, fudgy and have a dense and creamy texture that melts in your mouth. To make the brownies, we use almond flour, chocolate, butter and they are the best low carb dessert ever – only 2g carbs. In less than 40 minutes you have the perfect keto brownies that are the ideal company for a cup of keto coffee or your favorite tea. Looks easy right? It really is. So what are you waiting? Gather all the ingredients, preheat the oven and make a batch of my keto brownies. 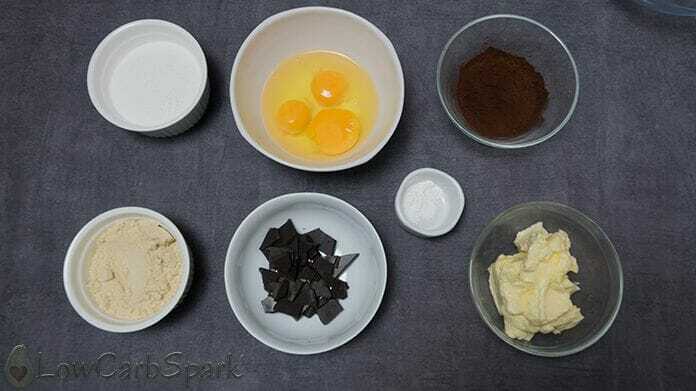 Learn what are the ingredients for the brownies recipe and how to make the perfect fudgy dessert. keto approved sweetener – You can use Erythritol, Xylitol (no aftertaste), Monk Fruit. 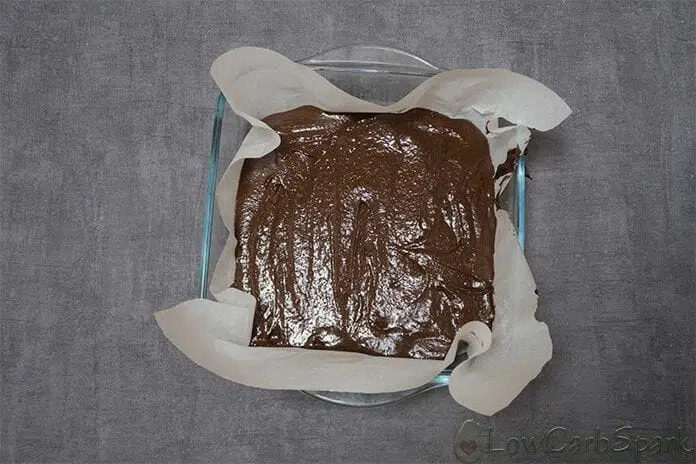 high-quality dark cocoa – Cocoa it’s a key ingredient here since it will make the keto brownies very delicious and chocolatey. Cocoa powder also helps with the texture. The brownies are sugar-free, gluten-free and with a few switches, you can make them paleo compliant too. The instructions are simple, and for the step-by-step guide on how to make the perfect brownies, you can watch the step-by-step video keto brownies recipe that shows you exactly how to make it. Melt together the chocolate and the butter. In a bowl crack the eggs. Using your mixer, mix them for 1 minute. Combine the dry ingredients and then add them along with the chocolate mixture over the eggs, using the mixer. Transfer the batter to a pan and then bake for 20 minutes. For a step by step guide on how to make this delicious keto dessert you can watch the video I created. They last for a week in the refrigerator. You can also freeze the brownies and eat when craving a chocolatey keto dessert. If you want to use a different sweetener, just taste test and adjust it to the desired taste. The recipe is super low in carbs and tastes divine. It’s the perfect cure for a sweet tooth on the ketogenic diet or any low carb diet. What are the macros for these keto brownies brownies? A serving has only 2g net carbs. Subtract the dietary fiber from the total carb count to get to find out the net carbs. This keto brownies recipe yields 16 generous servings that also low in carbs and calories. Can you replace almond flour with coconut flour? For this recipe and the sake of great texture, I don’t recommend using coconut flour. Coconut flour absorbs liquid very quickly and you may end up with dry keto brownies. However, I’ve got another great keto brownie recipe with coconut flour for you. 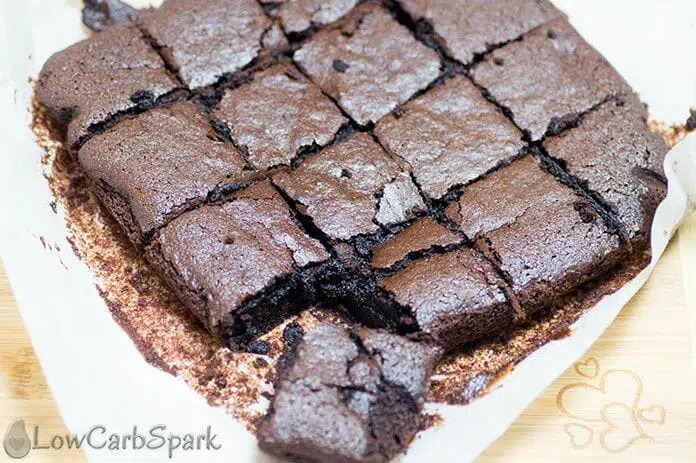 These bites of the chocolate heaven are dense and fudgy keto brownies made with almond flour. They are moist and have a rich chocolate taste. Line with parchment paper an 8×8-inch baking pan covering the bottom and the sides. In a bowl mix the butter and the dark chocolate. Microwave for 30 seconds or let the mixture melt on a double boiler. Meanwhile, combine the dry ingredients: almond flour, sweetener, cocoa powder, baking powder. In a big bowl beat the crack the eggs and beat them with the mixer. Add the butter and chocolate mixture and continue mixing. Slowly mix in the dry ingredients, until you get brownies batter consistency. Transfer the batter to the baking pan and bake for 15-20 minutes. Depending on the oven you have the baking time may vary. You’ll want to check the brownies from minute 15 to make sure you aren’t overbaking them. The center has to be slightly moist when touching. This recipe yields 16 delicious keto brownies servings, each for 2g net carbs. Make sure you use room temperature eggs. Using cold eggs will solidify the butter mixture. You can add a few nuts, like crushed almond or walnuts for a bit of extra crunchy texture. I prefer my brownies more cake-like in texture rather than fudgey. How can I achieve that using your recipe? If you cook them for another 5-10 minutes you will get the keto brownies you are looking for. In the video it says 1/4 cup cocoa powder. In the recipe written it says 1/2 cup. Which one is it? Hello Melissa! It's 1/4 cup cocoa powder. I'm sorry for the error. How did they turn out? Can you replace the erythritol with stevia or truvia? If so, would you still use 3/4 cup? I used Stevia and put 4 packets in the mix and dusted 2 packets on top when it came out! I don't have the confectioners erythirol, is there something else I could use? I used THM brand which is "granulated" and it was fine. These came out really yummy!!! Thanks! A friend of mine is deathly allergic to casein, is there a substitute I can use for the butter without ruining the consistency of these or would I just need to add in a bit of gelatin or something to keep the brownies properly emulsified? Probably vege or coconut oil, I know a lot of box mix brownies use oil instead of butter would probably translate well to here. Probably any oil would work tbho. They turned out better than I expected! Definitely getting my chocolate fix in! Everytime I make this, it just turns out so bitter. I tried with dutch processed cacao and just regular unsweetened cacao. Maybe I just have to go with less cacao ? Hello there! What sweetener are you using? Some sweeteners turn out bitter when cooked (stevia for example). Top it with a cream cheese frosting. It should taste better! What kind of Dark Chocolate did you use? I can't find low carb dark chocolate anywhere! It's all at least 17carbs/ a piece, so that'd be alot for 2 oz! There are a few brands that have only 8g. Lindt has a 99% dark chocolate bar which is excellent for this recipe! Did you try the baking aisle? I usually get a 4oz 100% cocoa bar by Bakers at Walmart. These turned out amazing! I was looking for a good brownie recipe. The ones I’ve tried turn out like cake. I made another recipe right before this one today and threw it out. But This recipe is exactly what I was looking for. True to a regular brownie. Moist, fudgy and melts in your mouth. Thank you!! Can coconut palm sugar be used as the sweetener? You can, but they won't be keto anymore. I know you said not to substitute coconut flour, but we were blessed with nut allergies. I used the coconut flour and added 2 tbsp of heavy cream to the batter. They turned out so good. Just to confirm the amount of butter in the receipe. 12 tbsps???? Yes, to make the keto brownies you'll need 12 tbsp butter aka 1.5 sticks butter or 170g. Can you substitute butter with coconut oil? Would this keep them as keto? Yes, coconut oil it a great keto substitute for butter. At 25 mins they are so jiggly. Will they set if I take them out? You should cook them for longer. I did this recipe today and after 35mins, the batter was a bit firm. Just to clarify, you used swerve confectioners not granulated right? I used Swerve Confectioners. There's a link showing you the exact product I used. Let me know how the brownie turned out!! I followed your recipe exactly and they’re pretty bitter. Don’t taste much like chocolate maybe it’s the dark chocolate I used?? Hello Melissa! What sweetener have you used? Im super confused I looked up all the ingredient and added the net carbs and it came out to Flour being 8, Coco powder being 8 and the erythritol being 108 added all that up and divide by 16 and got 7.75 net carbs lol. What am i missing here? Erythritol is a sugar alcohol that does not affect blood sugar, so we don't count the carbs from the sweetener. Thank you sooooo much! Newbie here lol. Hello Pam! I am thrilled you enjoyed the recipe! Thanks for the lovely comment! Hi, I'm getting ready to pour the melted butter and chocolate into the beaten eggs and I'm wondering if it has to cool a bit first? Or is it okay to add it hot to the eggs? Let the butter chill, otherwise, it will cook the eggs! Thank you, that's what I thought, so I waited. They are so delicious! What a boost they gave me, too. I'd been feeling low energy and these picked me up so I could work out. Next, I'm trying your bread recipe! As much as I'm enjoying cloud bread, I need a change. 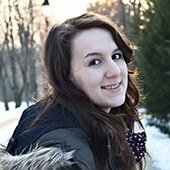 Thank you so much, Ioana! Hello, Vicki! I am thrilled that you loved my keto brownie recipe! Let me know how the keto bread turns out too. Just add a tiny bit at first to temper the eggs and mix as you do it, then a bit more and mix then you can add all of it. Just took them out of the oven. I Forgot the baking powder but they came out delicious!!! I made these brownies and ate a couple of them already. They turned out really good and were better than the last recipe I tried. They are more like a real brownie and not as cakey as the last recipe I tried, although, I would like them to be even more chewy (I probably cooked a little too long;– 25 minutes I think) . But still,I will make these again for sure and thanks the recipe Ioana. Hello Eric! I think that these keto brownies are addictive or something. When I make the brownies, they don't even get to cool down completely. Everyone in my family loves them! I am super happy you liked them! Hey, Ioana! I currently have the swerve granulated in my pantry. Will the brownies still turn out or should I buy the confectioners? Hello Megan! You can use the granulated version. It works just fine. Thank you…. I’m about to make these and was just wondering the same thing!! I only have the granulated Swerve. Can I use granulated stevia? Sure! You can make the keto brownies with granulated sweetener. I’m wondering about the butter? It’s written 12 tablespoons is that correct? Yes, it's right. It's only 177g of butter. Yes, you can. Great low carb alternative. This will be my first keto dessert recipe to try.Can I use Stevia in the raw as my sweetener? Will it make the brownies bitter? If so how much should I use? From the feedback we've got you're using stevia it will turn out bitter! I, personally never tried stevia in baked goods. Stick to erythritol or monk fruit sweetener. New to Keto but don't get along too well with dairy – would it be possible to substitute the butter for coconut oil? Hello Alia! I guess it should work well with coconut oil too, but I have never tried it. I think it would turn out slightly tasting like coconuts. Absolutely delicious, I did cook for 6 minutes longer, could be my oven. But loved them. Took them to a friend's and they friends husband said he would eat these over regular brownies. Delicious! I made them in a greased muffin tin and came out spectacular. Thank you. Would this work with monkfruit granulated sweetener? Yes. It will work. Just adjust the quantity to the desired sweetness. Rachael, I have monkfruit granulated sweetener also. I was wondering how much you ended up using? Thanks! If you are not on a keto diet and don't mind the carbs, sure. Cannot wait to try these! The last recipe I used were cake like and they fell apart. Thanks for the recipe and I’ll let you know how they turn out! Hello Diana! If you try my recipe, let me know how it turned out! Can't wait to see your result. Can I replace almond flour with coconut flour ? can i replace Erythritol with Stevia ? Unfortunately, almond flour and coconut flour aren't 1:1 substituents. Coconut flour absorbs more liquid than almond flour, so you won't get fudgy brownies. I don't use stevia in the baked good, because it makes them bitter. I have truvia cane sugar blend. (Stevia sweetener blended with cane sugar) can this be used? I picked up that same blend because I’m so used to using truvia and i didn’t realize it was mixed with cane sugar! Woops! Guess they will still be healthier than regular brownies? They’re still in the oven right now but they smell delicious! They are still healthier and lower in carbs than regular brownies. If I remember correctly, Truvia with cane sugar has 4g in a serving (1 tsp) which is not that bad. Second try these brownies turned out awesome. Thanks for a great recipe! Hey Linda! That's awesome you liked the recipe! Thanks for your review, it means a lot to me. BEST recipe ever! I’ve been Keto for years and this FINALLY is the brownie I’ve been searching for!!!!! Thank you! I did add a 1/4 cup chocolate chips into the batter, they give a little gooey pop of delight. Thank you for putting this recipe together! These brownies were a HIT! SO delicious! I do think the baking time should be modified. They were no where near done in 15 or even 20 minutes. It took about 32 minutes and they are JUST RIGHT. I did sub 2 oz nestle semi sweet chocolate chips for dark chocolate, the macros stayed the same. Cut the pan into 12ths and there are just 3 net carb per brownie! THANK YOU! Hello Crystal. 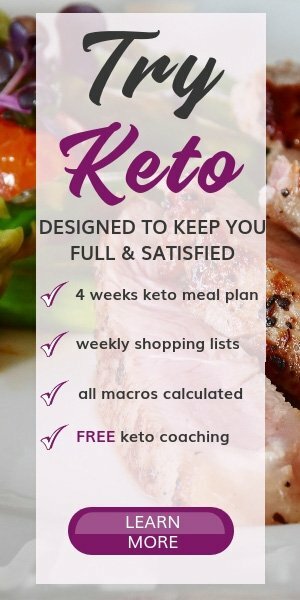 At the bottom of the post, you get the recipe card with all the ingredients, instructions, macros and even a video showing you how to make the keto brownies. You’ll need 3 eggs at room temperature. The butter I used pooled on the top of the brownies when I pulled them out of the oven. I had to dab it up with a paper towel. I used 12 tablespoons as directed. Have you heard of this happening before? From what I know it’s not butter it’s the cocoa butter from the dark chocolate. This usually happens when you overheat the dark chocolate when making the batter. Hi – these are fab but how long will 16 keep in an air tight container or can I freeze?! Keep the brownies in an airtight container and they last for a week in the refrigerator. You can also freeze the brownies and eat when craving a chocolatey keto dessert. Sounds delicious, Johanne! I am thrilled you liked the keto brownies because they are one of my favorites too! Do you use confectioners or granulated erythritol? Thanks! Hi! Do you use salted butter? If I’m using a throw away aluminum pan, how much time should I adjust the baking? Thank you so much! Excellent! I usually avoid chocolate Keto desserts because I don’t love dark chocolate and it always tastes bitter. These were really good. I added a teaspoon of vanilla. Thank you!! I have tried this recipe 4 times. The brownies always seemed a bit too cake like for me so the last time I used two eggs instead of three. This was perfect for making the texture more fusge-like and now I feel like I’m cheating! I’ve avoided sweet treats since trying to reduce my carb intake (not doing strict Keto), but I was having a friend come for dinner this evening, and she has coeliac disease, and I needed a gluten free desert. I made this recipe with home-made, gluten free baking powder, and was amazed at how they turned out. We had them with cream, and I honestly couldn’t tell them from the ones I used to make with flour, and loads of sugar. Thanks for sharing this really great recipe – they went down a storm! Just a couple of things I noted – as you say, the eggs really do need to be at room temperature. Mine were, but it was pretty cold today, and they made the mix much stiffer, which I had to spread into the tin, rather than pour, as in the video. I also had to cook them for about 50 minutes, as every time I tested them, the middle felt really soft, almost liquid. In the end I took them out of the oven, ready or not, as the edges had started to look like they might burn. Pleased to say, the brownies didn’t sink, and firmed up as they cooled. I popped them in the freezer for 20 minutes once cool, which made them much easier to cut. 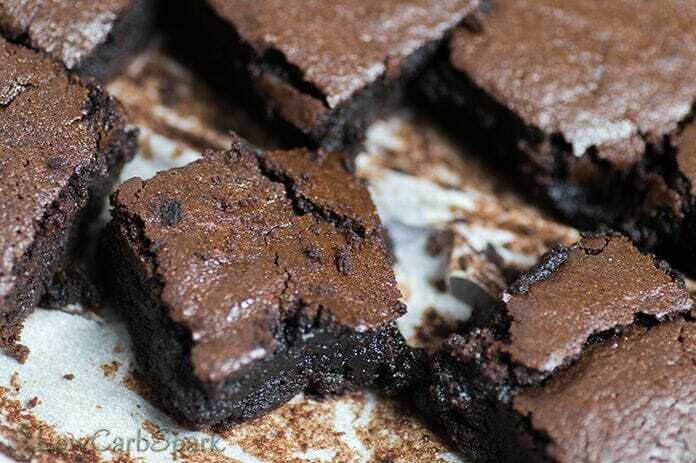 I would make these over regular brownies any day! Ok, so I’m not an experienced baker by any means and had no idea what to expect with cooking with powdered stevia. Let’s just say that you can NOT substitute stevia in the same amount as the recipe calls for with erythritol. Oh my it was so gross I had to spit it out! Next time I won’t experience, and I will follow the recipe verbatim. Do you use unsalted or regular butter? These are SO good! I added a 1/2 teaspoon of vanilla extract to the mixture. Turned out so fudgy. Exactly what I was hoping for. They were gone the second they cooled off and were cut! Family loved them. Thank you for this recipe! Thank you, Kimmy! I am so happy you enjoyed the recipe. Just made these and added unsweetened coconut flakes and a little chopped almonds. Almost didn't make it to the oven because the batter was delicious. The brownies turned out better than the batter! These are unbelievable!!!! 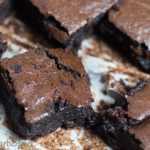 Hi Teresa and thank you for the kind comment and great review on my keto brownies. I am so happy you liked the recipe!! Great recipe! I used Swerve granulated and they were delicious. 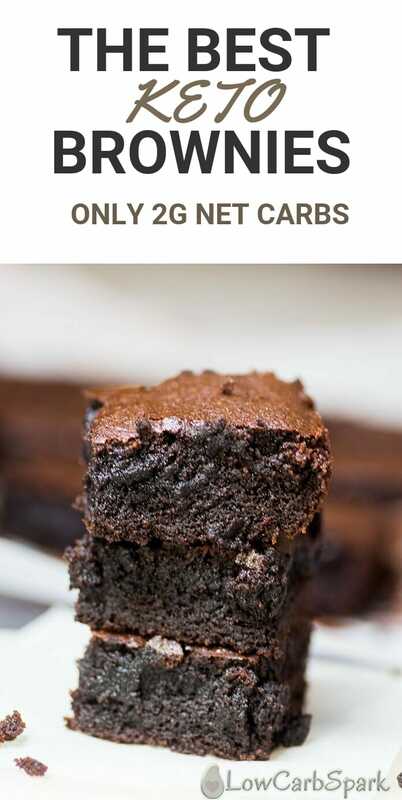 One question though – you say less than 2 carbs per brownie but in the nutritional facts it says 4g per brownie. What’s accurate? Made these with my 5yo daughter today! Even my keto-skeptic husband had two! Thanks!! That is great Jenevieve. I am super happy you all loved them! Question: do you have to refrigerate these after they cool? Excited to try them but don’t want them to spoil overnight . Thanks in advance! Hi there Katie. I keep them at room temperature overnight, if they last that long. Everyone in my family loves them. If you want to keep them for longer, refrigerate the keto brownies for up to a week. If I can't find the Special Dark cocoa powder, can I use regular Hersheys unsweetened? It's perfect Jenny. Let me know how the keto brownies turn out. Omg!!!!! These are THE BEST by far. Like many others i have tried various keto brownies recipes and none is even close to this one!!!!! Its simple but yet so sophisticated. I think i am in love…well my boys are anyway… thanks a million!!!!!! I would give it a million starts if i could. This indeed the best review I've ever had on this recipe!! I am thrilled you loved the recipe! Keep up the good work. Flavor was delicious. My were a little liquid in the middle so I cooked them longer but the brownies were so fluffy and airy and fell apart easily. I wonder if it was beaten too long. Oh will keep experimenting but good taste. All responses I've read are excellent and very helpful. Can you substitute avocado for the butter. I'm just curious? Oh, I'm not sure if you can replace the butter completely with avocado. Maybe you can use a combo of mashed avocado and coconut oil. You can take a look at my other recipe: <a href="https://www.lowcarbspark.com/avocado-brownies/&quot; rel="noopener" target="_blank">avocado keto brownies</a>. I tried making these tonight and I followed the recipe exactly and it was a thick consistency like I just whipped heavy whipping cream what did I do wrong? Maybe your eggs were smaller. You should add more liquid until it gets to the consistency shown in the video. I can’t Figure out what I’m doing wrong! two attempts and both failures. I get brownie batter texture with about 1/4-1/2 cup of unevenly mixed dry mix left. What’s the size of your eggs? What coconut flour are you using? It may be more absorbent than other brands. Can i use truvia? I know it wont be keto but that is all i have on hand right now….and how much do i use? Same amount in recipe??? Can I make this without the chocolate bits? Can I just make them with cocoa? Hi! First timer to your blog. Was gathering up recipes for best keto brownies, and yours came up quickly (excited to try it). Just wanted to mention, for those who have been experiencing dryness or brownies breaking up, that on another blog, it was recommended NOT to “overmix” or it would come out dry. Also, I would make sure your baking powder is fresh; old powder has spoiled many an otherwise “perfect” recipe. These are some excellent tips. Thank you, dear Cheryl, for being here. I found a sweetener conversion chart and used 1/2 cup of Pyure all purpose blend in place of the 3/4 cup erythritol. They turned out great Although I had to bake them around 35 mins. They were kinda jiggly after 25. I’m not sure where I went wrong bit my batter was much firmer and it came out more like a flan..
My guess is that either your eggs were smaller or not at room temp. This are two main causes of why your batter was so thick. In any case, you can simply add some warm unsweetened coconut or almond milk to get the desired texture. I have no idea what happened. I followed the recipe exactly except cut back a tiny bit on sugar b/c I used lilys dark choc with stevia. I watched the video and my batter was much thicker than the video. Was it b/c i used lilys dark chocolate with stevia fort the dark chocolate? Then it took way longer to bake. They were still liquid at 15 minutes. The texture is strange and not good at all. I wish I had a better report. Would love to hear if anyone else used Lily’s with stevia. My guess is that either your eggs were smaller or not at room temp. This are two main causes of why your batter was so thick. In any case, you can simply add some warm unsweetened coconut or almond milk to get the desired texture. I’m not a fan of stevia-sweetened products as they always get bitter when baked (at least in my case). Thanks for this recipe it looks great! I have few concerns for the sweetener I’m going to use which is Steviasweet Crystal (Stevia & Erythritol). Apparently 1/2 cup of Steviasweet crytal is equvilant to 1 cup of normal sugar. Do you have an idea how much of this sweetener I should be using in this case? It’s my first time backing with sweeteners and that’s the one I got at the moment. Hey there. I’d say you’ll need about 1/2 cup of that sweetener. Taste the batter and if it’s not sweet enough, add 1/4 cup more. Would Monkfruit sweetener work? It is granulated, not powder. Would it still be the same measurements? Yes. Monk fruit is a great sweetener. Keep the same measurements. Hi! Very good brownies! Wonder if I could bake them in a muffin pan next time have you tried that? Took around 35 minutes to fully bake but oh my they were delicious! My family and I are definitely going to be having these as a no sugar dessert! I have lost 38 pounds on low carb no sugar and this really quenched my chocolate craving! Congratulations on your progress, Sherri! That’s fantastic. I haven’t tried making them in a muffin pan, but it’s definitely possible. They will probably bake quicker. Just keep an eye on them. Made these tonight and they were delicious!! I used granulated swerve for my sweetner. I will definitely be making them again. Thanks for the recipe and satisfying my sweet tooth! That’s fantastic, Lauren! Thank you for the review!! I have lakanto monk fruit sweetener with erythritol. Would i use the same amount or would it change? The whole family loves them! They really have that perfect brownie feel. Thanks for the delicious recipe! Is that confectionery sugar or granulated? I used granulated sweetener, but you can use any sweetener you have on hand. Thank you for the recipe! I had to bake them an extra 10 minutes but they are my new favorite keto dessert! Did you by chance enter this into myfitnesspal to get your carb amount and what not? No matter how I enter it, I’m not getting the same numbers. I was just wondering if you could show what it looks like on myfitnesspal? Thanks. I will update the post with a detailed macro count for these keto brownies :). I used myfitnesspal. I just got done making the batter and it’s super runny and soupy. I followed everything. What can I do??? Add more almond flour or a tbsp of coconut flour. I accidentally put an extra 4 Tbsp of butter in this brownie batter and they still turned perfectly gooey and amazing! Wow, Kelly, that’s fantastic to know. I am really happy my keto brownies recipe worked for you. AMAZEBALLS!!! Thank you! I live in Tahoe so I worry about high altitude adjustments. None were needed! I like them cakey so I left them in for 25 – 30 minutes. They are moist, amazing, totally satisfied my hankering for sweet. I made this and they are so fudgy! YUM! I made ganache to top them,because my Grands are coming later. Chocolate overload. Thanks for the recipe. Sounds yummy! I am thrilled you liked the recipe!! Can you double the recipe easily? Yes, definitely! My fantastic readers double this recipe all the time. Best recipe I’ve found!! Totally satisfies my chocolate cravings and sweet tooth! So I made the brownies after 20 minutes in the oven the center was really loose still so I put them in for another 7 minutes what should the center be like? The middle should be set, but soft to touch – not stick! That’s great you baked it more! I just attempting to make these brownies but I think I did something wrong. I did the butter,almond flour,eggs,unsweetened dark cocoa powder,2oz baker unsweetened dark chocolate,swerve sugar,and baking powder. I just made these and i let them bake for about 25 mins and they were still really jiggly. I tried to cut into them and they were barely cooked. They are back in the oven now. Why are they coming out so wet? I made these for the first time last night and was pleasantly surprised at how tasty this recipe is. This recipe was super easy to make and turned out perfect. Thank you for sharing! Wow, Kayla! I am extremely happy you enjoyed the brownies!